The new Range Rover Sport has made its debut in a daring race against two open-water swimmers, crossing the flooded causeway to Burgh Island – usually accessible only at low tide. The demanding point-to-point is the latest in a series of challenges completed by the Range Rover Sport, including a record-setting hill-climb at Pikes Peak, a record crossing of the ‘Empty Quarter’ desert in the Arabian Peninsula and last year’s Downhill Alpine Ski Challenge. 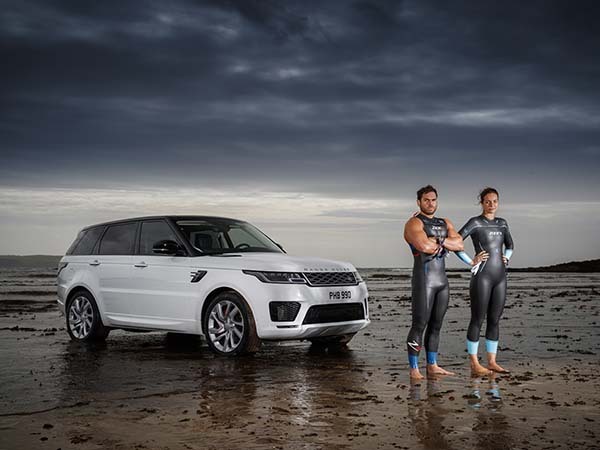 With two-time open-water swimming world champion Keri-anne Payne and endurance athlete Ross Edgley hitting the waves, the Range Rover Sport faced soft sand, tidal roads and waded through waves up to 850mm deep on its 14km (8.7-mile) inland drive from Bantham Beach to Burgh Island in South Devon, UK. The team of swimmers faced a challenging 1.5km (0.9-mile) course across the choppy coastline while the new Range Rover Sport P400e electric-petrol model encountered roads flooded by the incoming tide and used its EV mode to make near-silent progress through the tiny villages along its route. The performance SUV reached the beach just as the tide covered the sand that links Burgh Island to the mainland, leaving the Range Rover Sport to put its wading capabilities to the test and overtake the swimmers just before the finish line.